The first generation Nobukuni (信国) was from Yamashiro Province (山城国). He was the son of Ryôkai Hisanobu (了戒久信) and he is thought to have been one of the three great students of Soshu Sadamune (相州貞宗) (Sadamune San Tetsu). He was active in the early to mid 1300’s. He is classified as both a Yamashiro smith and a Sôshû smith in the various references. Since his working style was Sôshû rather than Yamashiro, we will classify him as a Sôshû smith. 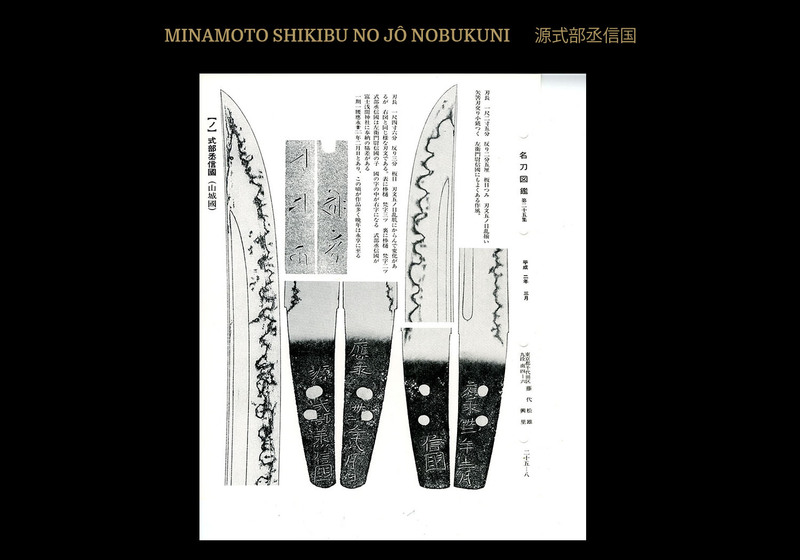 The second generation Nobukuni (信国) made blades in the middle of the 1300’s while the third generation of smiths by this name worked in the last decade of the 1300’s through about 1430 in the Oei era (応永). Following him in the Oei era (応永) there were two Nobukuni (信国) smiths of high repute. The first was Minamoto Saemon no Jo (or Genzaemon no Jo) Nobukuni (源左衛門尉信国) and the second was Minamoto Shikibu no Jo Nobukuni (源式部丞信国). More will be said about these two smiths later. Tachi are comparatively few, katana, wakizashi and tantô are more common with wakizashi and tanto being most common. The work of these smiths is in the Sôshû style. In other words, the kitae is most commonly a hadatachi (stands up) itame and mokume, with ji-nie. 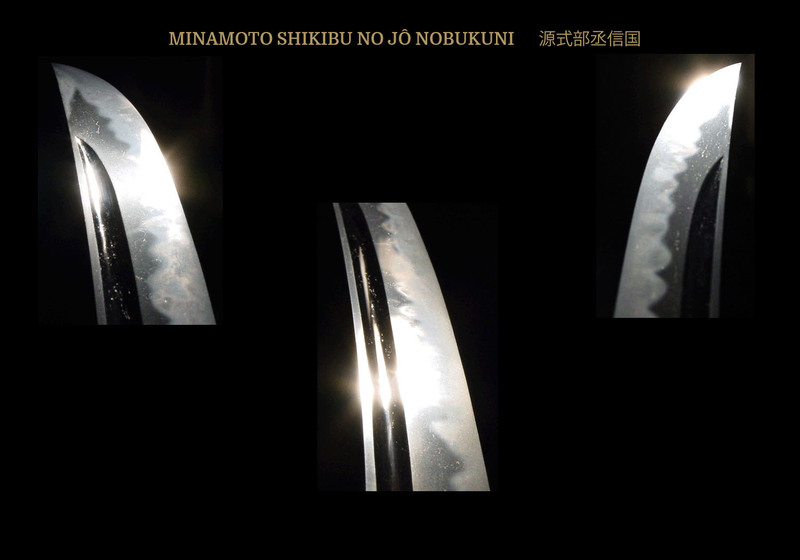 As for the hamon, there are some with the Ryokai (了戒) style of suguba, but the majority of blades are a gorgeous midareba of gunome or notare, the ji-nie is strong, and everyone in this group was skilled at horimono. As stated, the shodai Nobukuni (初代信国) worked around the Kenmu era (建武)(1334-1336) and is said to be the son of Ryokai Hisanobu (了戒久信) also known as Ryo Hisanobu(了久信). He is said to have been the pupil of Soshu Sadamune (相州貞宗) but there are almost no signed works remaining by this smith. A large number of works by the nidai Nobukuni (二代信国) from around the Joji (貞治)era (1362-1368) are seen. The works of these first two generations of Nobukuni (信国) are said to be extremely superior with the tsurikomi, shape, and such done in the Sôshû style. The kitae resembles that of Sadamune(信国)and is fairly coarse. It is mokume hadatachi, with ji-nie and chikei. As for the hamon, notare-ba is the most common, the ko-nie is deep and there is kinsuji and inazuma. The nakago saki has a hint of haru (tends not to be tapered), and the kurijiri is fairly deep. As for the yasurime, kiri is the most common. The horimono will be skillfully done. 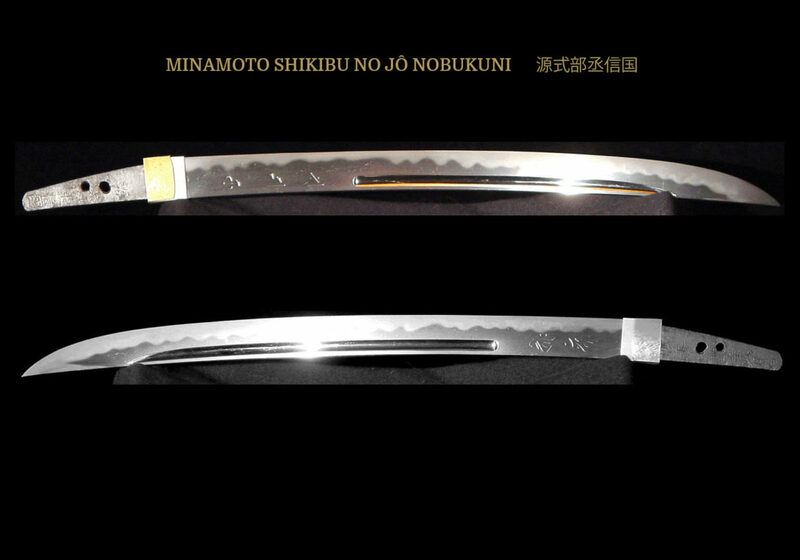 The third generation Nobukuni (三代信国) and the successive generations of smiths by this name, who worked well into the Oei (応永)era, had a unique style of hamon composition making the kantei of his blades relatively easy to distinguish from the first two generations. Their gunome often forms the so-called yahazu-gokoro patterns (shaped like arrow notches) consisting of two similar gunome placed next to each other. 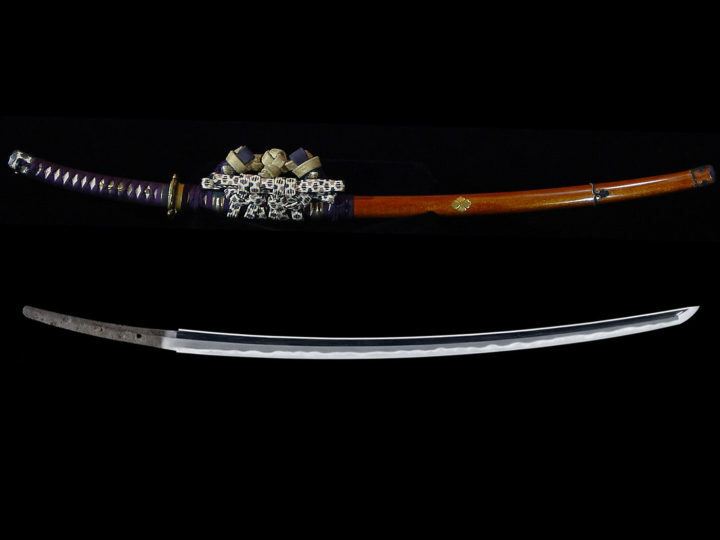 Further, the yahazu-gokoro hamon includes a short or low-headed gunome in between them, making this the key kantei point of the hamon of these particular Nobukuni smiths. Such patterns may regularly be found along the length of the hamon, or in some works they can only be seen in certain areas along the edge. If they are present, however, they definitely point to one of the later generations of Nobukuni as being the smith in question. The generations of smiths named Nobukuni (信国) that followed the third generation are generally referred to as the Oei Nobukuni (応永信国). While there were several smiths of this name and most never reached the quality of the first three generations, there were two smiths among them, however, that do stand out as far as superior workmanship is concerned. The first was Minamoto Saemon no Jo (or Genzaemon no Jo) Nobukuni (源左衛門尉信国) and the second was Minamoto Shikibu no Jo Nobukuni (源式部丞信国). Both of these smiths left wonderful blades but their skill never reached the zenith of that of the first two generations. Also since they made blades well into the Muromachi era, the overall shape and style of their blades make it possible to easily distinguish between them and the first two generations. 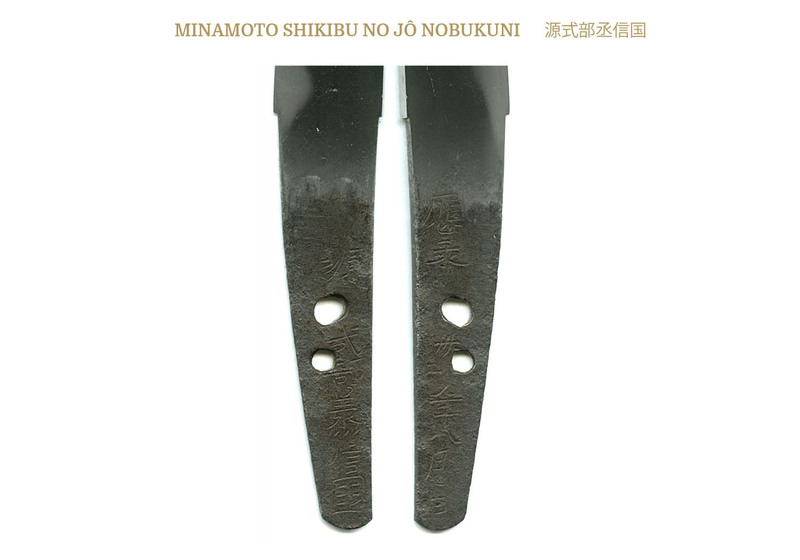 The second of these two smiths is Shikibu no Jo Nobukuni (式部丞信国). His is said to have been the younger brother of Genzaemon Nobukuni (源左衛門信国). He signed with the two-character signature, Nobukuni (信国)and he also signed with his given name of Shikibu no Jo Nobukuni (式部丞信国). He also included the honorific title Minamoto (源)in his signature thus giving him his full signature of Minamoto Shikibu no Jô Nobukuni (源式部丞信国). 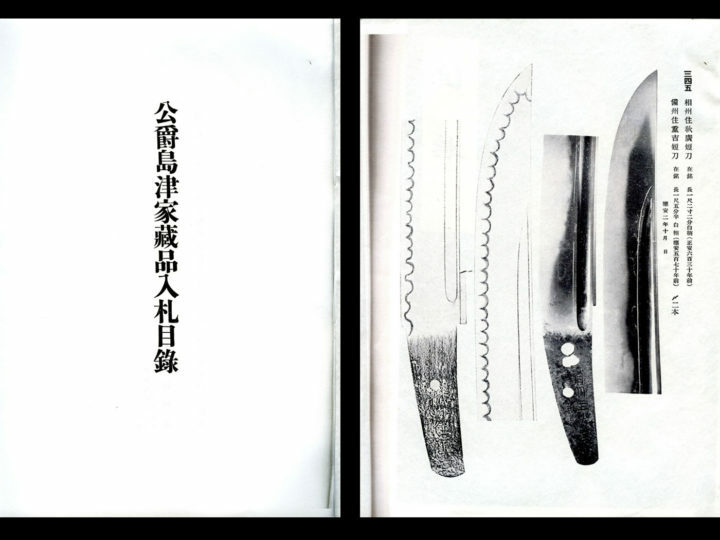 His skill was equal to that of his brother and, as with all of the Nobukuni (信国)smiths, he was a skillful horimono carver. SUGATA: Wakizashi and tanto are most common with tachi or katana being rare. Tanto and hira-zukuri wakizashi sugata will be sun-nobi with modest sori (saki-sori) and thick kasane. Mitsu mune is usual. Shinogi-zukuri, iori mune wakizashi will also be found. JITETSU: Works with itame hadatachi are the most common. There will be abundant ji-nie and shirake-utsuri will be found and is said to look like rising smoke. HAMON: During this period, the smith’s began working in a gunome midare-ba that was very distinctive. The pattern consists of two gunome juxtaposed and repeatedly presented with intervals formed of low-headed gunome in notare-gokoro. Some of the paired gunome look like yahazu, giving this type of formation its name. We also find works tempered in suguba, and notare. In those with suguba, the kitae is fine, the color of the ji is dark, and the color of the hamon is muddy. Tempering will be done in nie in the Sôshû style. There will be sunagashi, kinsuji, and mune yaki in most works. BÔSHI: Most will be midare-komi with a deep kaeri, often forming muneyaki. The bôshi will often differ from one side to the other. Hakikake and a somewhat pointed tip will also be found. HORIMONO: The Nobukuni smiths were extremely skillful carvers. 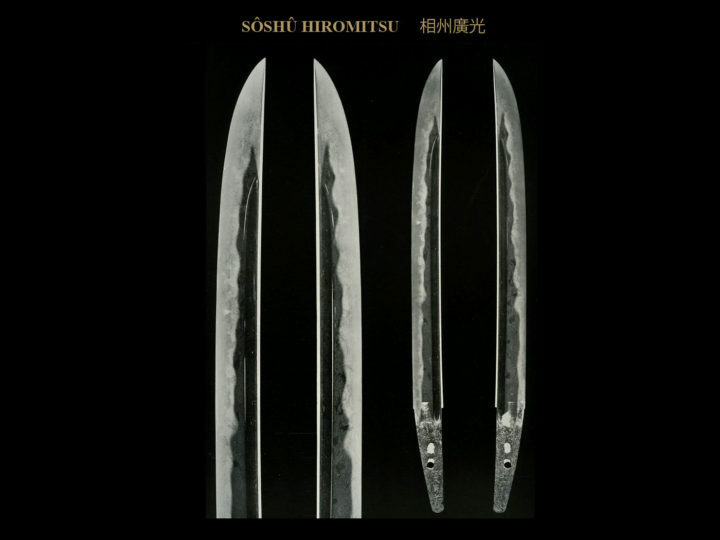 We find a variety of fine horimono such as bo-hi, soe-hi, tsure-hi, futatsu-hi are common. Occasionally very intricately carved designs will be found on blades in combination with the various types of hi carvings and will be done in a uki-bori style. NAKAGO: The nakago will be short and stubby with a narrow tip that is usually ha-agari-kurijiri. In the works of the latter period the nakago mune will be slightly round. The yasurimei will be kiri or sujikai. MEI: Generally the mei will be given in the two characters (ni-ji mei), Nobukuni (信国). 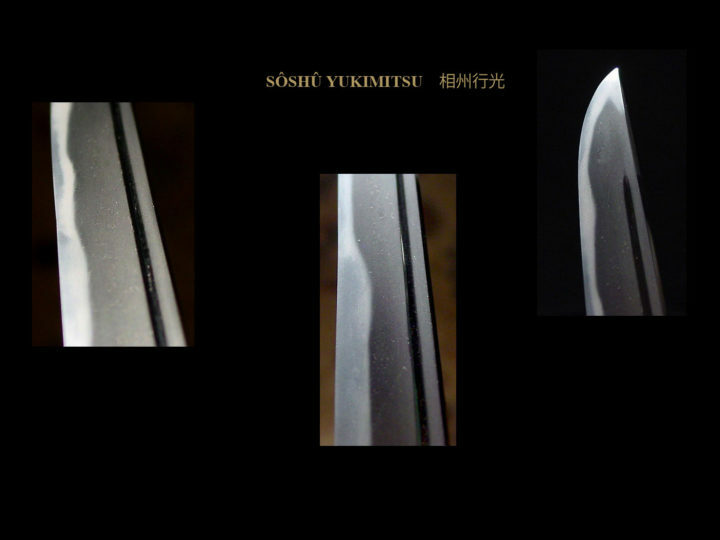 Occasionally we find swords that are signed with the full name of the smith such as Minamoto Shikibu no Jo Nobukuni (源式部丞信国)or Minamoto Genzaemon no Jo Nobukuni (源左衛門信国).